In this 12th episode of the profit, camping billionaire Marcus Lemonis visits Unique Salon & Spa. Founded 16 years ago (in 1998) by Carolyn Devito and EX-partner Joseph Secreti when the couple bought their first salon, the business quickly expanded to four locations. – Unique Salon and Spa Massapequa NY. They specialize in making hair but also provide almost all wellness-type services from massages to nail manicure and pedicure. Unfortunately, like any business owned by partners in love, the business can get into SERIOUS trouble when the love is gone. This episode of the profit is exactly the case. After a bitter legal battle, Carolyn got to keep the chain of salons ending up with a mountain of debt. She is now trying to save her business running it alone after the departure of her partner Joseph. Even with over 4 million dollars in annual generated revenue, single mother of 3, Carolyn, struggles to pay down her debt and this shows the state of her financial situation. She hasn’t taken a paycheck in 6 months. Marcus Lemonis hopes that by trying to bring in a new look, attitude and energy, Unique Salon and Spas‘ situation may turn for the better and start generating a solid profit. Marcus arrives at the salon and is pleased with its location. Located in a shopping center, the business is in prime position to get the traffic it needs. He however, notices that on the inside, Unique Salon and Spa seems to be a mix between a flee market/jewellery/clothing store and a salon. Looks like Carolyn is trying to squeeze out a bit more revenue by adding a few items for sale. She explains to Marcus that women like to do a 1 stop shopping so she is catering to that. Marcus sees it as a big mistake simply because that is a space she could use to sell her salon related products. He quickly finds out that the “extra stuff” Carolyn sells contributes to just 5% of her revenue even if she makes around 50% profit on them. She also tells Marcus that she created her own line of hair care products called “I am Unique” which she sells in her salons. Marcus asks her if she sells the product line outside her chain of salons and she answers no. Carolyn tells him she hasn’t had the time to look for other avenues to sell the products. Carolyn opens up about how she got into the business. She and her ex-partner Joseph founded Unique Salon and Spa but then things went sour when they separated. After a very ugly legal battle, she was left with the business but with a lot of debt and a ruined credit rating. In the next scene, Carolyn takes Marcus for a tour of the salon and we see that it lacks the right atmosphere. Everywhere you look, you see run down equipment, dirt and very old furnishings. 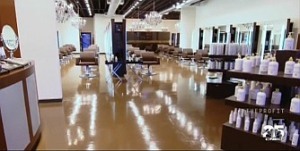 This very uninviting environment which all the employees hate, may be the reason the salon is empty. Carolyn then introduces Marcus to her general manager Susan. He tries to find out why the need for a general manager and Carolyn tells him that its to take care of all the company needs, ordering products and staff reporting etc without needing her personal involvement. Marcus still ins’t convinced of the need for a general manager. Marcus soon finds out that there is Debbie, the manager of the Syosset salon. Debbie finds it hard to explain what difference there is between her job and Susans’ (the general manager). We soon find out that there may be some drama between Susan, the general manager and her Plainview Salon manager Lacey. A confrontation ensues when Lacey leaves her store to meet Susan at Syosset to talk about a broken air conditioning system. Lacey claims that Susan didn’t take care of the problem earlier but Susan says she did. Marcus and Carolyne speak to Susan about it and it starts to be clear to us that Susan may not be taking her job as a GM seriously enough, she is more interested in overseeing the managers under her than helping them solve problems. In the next scene, the stylists of the salon pull Marcus aside to complain about Susan and the fact that her duties as GM are not being done. She is often missing from work when she is needed most yet Carolyn, not wanting to rock the boat often lets all this slide. Totaling roughly $4.2 million dollars. The Unique Salon and Spa Syosset location is currently not making a profit and Marcus wants to know how its revenue or $1.2 million breaks down. Carolyn tells him that 70% of the revenue is generated by the hair color department. This gets Marcus to light up like a bulb and he now realizes that the color room inventory could make or break the business and that the ongoing wastage must be stopped. The current debt of the business is $170000 and it employs 120 people. The staff payroll takes up 62% of the revenue and Carolyn will like that number to be 50%. Marcus tells her that to get that number down to 50%, they will need to take out over $400000 in labor costs. The business is struggling and putting a financial and mental strain on single mom Carolyn. Marcus says that is is time to get over it and move on from the dark times. Use of premium store space for sale of low return items. Run down uninviting shop environment. A lot of inventory waste, around 10% of $25000 color inventory on a monthly basis. General manager who is not actively working for the best of the company. Lack of a chain of command in the business. Marcus takes Carolyn to Chris & Tony’s restaurant to discuss the deal and what she wants from him. She tells him that her business makes money and she will like someone that will help her make more and take it to another level. She needs a new partner to help her after Joe left. Marcus tells her that it looks like the inmates are running the asylum. He tells her that the salon is in such a run down state, he wouldn’t want to come into her shop to cut his hair. He tells her that he is not interested in becoming a big partner in an hair salon since its not something he can scale out to the whole country. 1. Redesign and relaunch the hair product line. 2. Fully renew and spruce up one Unique Salon & Spa location and make it become a beautiful experience for clients as well as profitable. 3. Inject some working capital to cover basic expenses and needs of the business. For his $200000, Marcus wants to have 20% of the salon business and 51% of the hair product line company. As always on the profit, He will be 100% in charge of the company for the short term. Carolyn says that her business is worth more simply based on the numbers and asks Marcus for more money. Marcus counters her with $250000 which will enable her to put the extra $50000 in her pocket. Carolyn wants Marcus as a partner and she takes the deal. He writes the check on the spot and hands it to Carolyn. Update the first location by renovating it and adding 8 new chairs and stylists which will increase revenue. Build a new color bar that will cater for the increase in the color department. Setting up the power structure to make it clear who is in charge of each location and what everyones’ job is. Improve hair product line brand and packaging. Removing wastage at the color bar. Improving overall moral in the salon. After the deal, Marcus takes Carolyn to Rejuvenol Laboratories, the manufacturer that produces Carolyns’ hair care products. He wants to find out how they can take the product from good to great. Marcus wants to improve the packaging. In this way, there will be an added feel of quality and people will be ready to spend more money to purchase the product. If it looks better, more will be sold. Just by changing the shape of the bottle, Marcus believes he can increase the price of the product line. Once this is done, he intends to distribute Carolyns’ product across the nation and make a million dollars in the first year. Increasing distribution of the product however will have to start in the surrounding salons and Joe, Carolyn’s ex runs about 20 of them. So is Carolyn able to move on and approach Joe for a business deal Marcus asks. Marcus goes straight to the point and says to Carolyn that they can take advantage of Joes’ resources for their own good and in business, emotions can’t stand in the way of expansion. Back to the salon in the next scene. Marcus talks to Carolyn about Susans’ incompetence as general manager and the fact that the color room which generates 70% of their revenue lacks inventory shows the lack of leadership. There is no standard inventory management system and the salon relies on looking at what is in the trash to know what needs to be ordered. Susan has to be fired Marcus says as he struggles to see what her role really is. In the next scene Marcus and Carolyn visit Belvedere. A manufacturer of state of the art salon seats, furniture and equipment. They are there to shop around for fresh new salon equipment for the Unique Salon & Spa renovations. The salon is going to become state of the art and the color bar will now be in the middle of the store where the clients will be able to see their color being made. 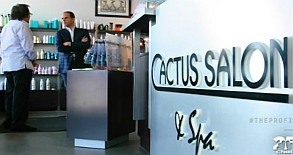 In the next scene, Marcus visits Joe, Carolyns’ ex partner at his Cactus Salon & Spa to see if Joe will be willing to broker a truce with Carolyn and a business partnership with him. Joe tells him he is ready to do that if Carolyn is ready. Marcus returns to the salon to find out that Susan left and walked out on the business. They call her to find out why she left and she hangs up on them. Looks like its over for her. After a bit of crying, Carolyn finds out that getting rid of Susan was long overdue. For Marcus, this is part of the plan to reduce the payroll expense. In the next scene, the ladies of Unique Salon and Spa pick up their hammers and renovations of the salon begins. The renovations won’t be for looks only, Marcus intends to add more chairs, more color which will add more money to the the company coffers. There will also be an area to merchandise their newly redesigned product line. Next, the team from Rejuvenol comes by to show the new packaging and for Marcus there is a problem. Carolyns’ product line is called UNIQUE, but that in itself is not a unique name, so the team comes up with a name that will include the names of Carolyns’ children Cole, Raquel and Erika. They come up with “Erika Cole by Raquel“. A few scenes later, Marcus takes Carolyn to meet Joe to see if they can both reach a truce and move on. At this meeting we find out the hidden details of the ongoing quarrel between Carolyn and Joe. Basically, according to Carolyn, Joe got paid huge sums of money monthly (a form of royalty I guess) till the business got sucked dry of money. She says Joe almost let her and her children end up on the streets. I guess its safe to say there wont be any business deal to make, but Carolyn got a lot out of her chest and is ready to move on. In the next scene the renovations are done and IT IS WONDERFUL. Even Marcus says its the most rewarding renovation he has done. Everything about the salon is high end and state of the art. The new product display is back-lit and really gives a super high end feel to the new product. The new salon opened and the entire mood is different. The staff are super motivated to work and the clients are loving the atmosphere. Renovations cost over $300000 but its already starting to pay off. All 31 chairs are now full and business is exploding. Each chair is now adding an additional $6000 revenue per month. Even the color bar is now in center stage. There is a new computerized inventory system to track inventory use and this will enable the salon never to lack the products it needs to get the job done. Marcus had AT&T come and install WIFI in the salon so the clients can enjoy being connected while they get their hair done while the business can take advantage of their new computerized management system. Marcus says the hair line product Erika Cole by Raquel, which looks great by the way, is going to be carried by Ulta stores in a couple thousand stores across the country and this is what will help take the business to the next level. As Marcus said, Just changing the brand and packaging brought a $4 price increase without any increase in production cost. But most importantly, Carolyn has overcome her fears and has let go of all her “baggage”. She is now ready for the new things life will bring her and this makes us all happy for her. So in the end, Marcus gets another one DONE. Unique Salon and Spa is on its way to massive success. I hope you enjoyed watching this episode like we did. Lots of important business lessons to be learnt and we hope you feel the same. What is the name of the software that they are using in conjuction with the Att&t solutions? It was an app that allows managers to do a closing checklist? I’m also interested in the AT&T solution referenced that allows managers to close via a required checklist. Did anyone find additional information on this? When watching the episode of “The Partner” here in Brazil, where Marcus Lemonis restores your company, it occurred to me the idea of offering ladies the oil Buriti. This product originates in the Brazilian Amazon and is widely used by cosmetic industries in Brazil. Buriti oil is used in shampoos, soaps, skin cream, moisturizing body oil. Due to its high beta-carotene content, it is very effective for hair growth, and a powerful moisturizer for skin. If possible, I would send oil sample for your review and development. If you can make contact with Marcus Lemonis to think of a unique product line for skin and hair, in the United States Buriti oil base. I’m sure it will be a great success. Great show! I’m writing from Brazil as well.